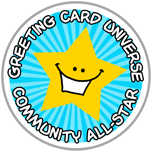 Wanted Cards get posted on both GCU’s Community Blog and on the forum. Shopper’s expectations are set at seeing new cards for their requests within 2 business days. Whoa, that’s quick! Too quick for you to pull something together? Perhaps not. Consider re-purposing a concept or elements of a design from one of your already approved cards vs starting from scratch. TIP: You can use the power of search to help you pinpoint possibilities. Search your own cards in Manage Cards via Find Specific Cards by Keywords to find occasions or specific elements you’re looking for. Important to note: Be sure when you submit a new card that is based on an existing approved card to include in your Notes to Reviewer the pid# for the reviewers’ quick and easy reference. This moves the review along for you and all other artists! For example: “this card is based on prior approved card pid#123456”. So, don’t feel like you have to create a new design from the ground up in 48 hours for a Wanted Cards request. Look to your own trove of existing designs and elements to come up with something new to meet the shopper’s needs. See the Wanted Cards forum board.